As always, if you come across something cool during the week, shoot an email to alex@macro-ops.com and we’ll share it with the group. Special Announcement: The Macro Ops Collective Now Open! It’s time for our spring enrollment into the Macro Ops Collective. This enrollment period will end on March 24th at 11:59PM so if you’re interested in joining our premium research community make sure to sign up by this Sunday. Every purchase comes with a 60-day money back guarantee no questions asked. That means you have a full two months to immerse yourself in our community, read through our research, see how we trade, and go through a huge library of educational material before committing your hard earned dollars. If the material isn’t a good fit, just send us an email and we will promptly return your money within the refund window. As always, if you come across something cool during the week, shoot us an email at alex@macro-ops.com and I’ll share it with the group. Value Ventures: A Prologue — Our value expert Mr. Bean talks a little bit about his value investing philosophy and lays out the plan for all future value based content. If you like deep value make sure to stay tuned to his releases. Macro Ops Podcast: Shippers – Bottom Fishing With Alex Barrow — Host Chris D. sits down with Alex to discuss his latest shippers thesis. Pop this episode in during your next workout or commute if you want to get up to speed on this bombed out sector of the market. Matthew Ball wrote an article titled “Nine Reasons Why Disney+ Will Succeed (And Why Four Criticisms are Overhyped)”. Matthew is one of the most insightful commentators on the media/tech landscape, in my opinion. I try to read everything he does. This article serves as a well-argued bullish overview of Disney’s opportunity (and challenges) in its transition from being a B2B to a B2C company that controls its entire stack. I should note that I may be biased as Disney is one of our largest equity positions. Here’s Ball commenting on one of the many benefits of Disney’s owning its distribution channels through its move to SVOD (Disney+, Hulu, ESPN+). Reminder… Disney, the company with the most valuable content IP and recognizable brands in the world, sells for just 15x earnings. That’s slightly less than Comcast at 15.8x and the market’s average of 21x. Makes sense… Here’s the link. Our buddy Biren over at Perseid Capital put out two must-read writeups on the whole $TSLAQ debate. The first one serves as a good overview of the evidence-based bear case against Tesla (here’s the link). The second is an excellent analysis of the company’s cash flows — or lack thereof — and some speculation as to when Musk and team will be forced into bankruptcy (link here). We’re short the stock through long-dated puts and will likely be adding to our position sometime in the near future. Finally, not sure how I came across this site but h/t to whoever shared it with me. It’s named Safal Niveshak, after the author. And it’s a collection of great original illustrations of key mental models, principles, and frameworks. There’s one for the Feynman Technique and another for Bezos’ Regret Minimization Framework. It’s pretty cool. Makes me wish I had the ability to illustrate something more advanced than just hand turkeys. 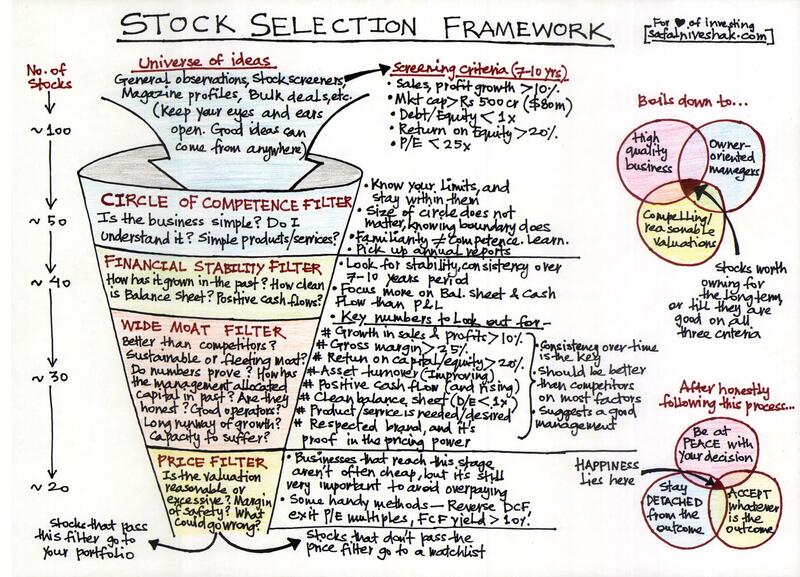 Here’s the link and an illustration of his framework for stock selection. 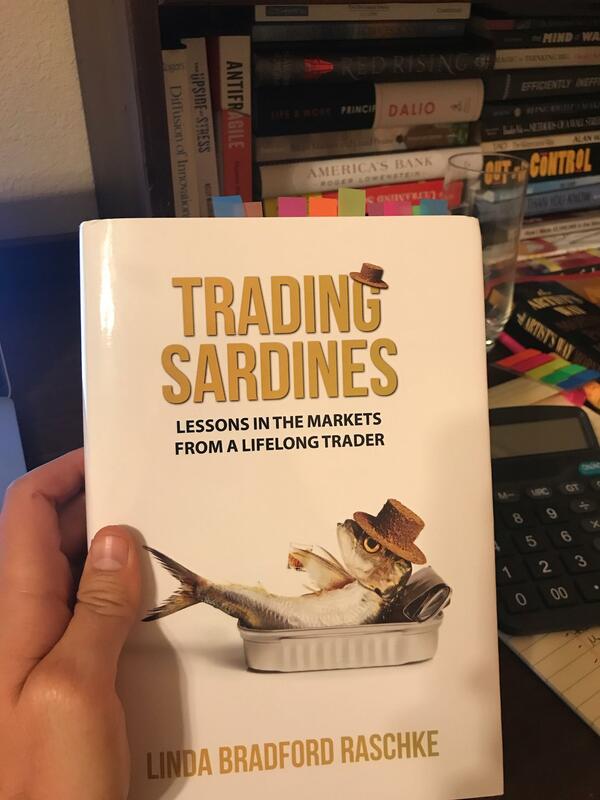 I’m currently reading Trading Sardines – Lessons in the markets from a lifelong trader by Linda Raschke. This also happens to be the monthly pick for our MO Book Club. Linda was nice enough to send the team and I an autographed copy and we’re hoping to get her on the podcast sometime here in the near future. For those of you who don’t recognize her name, Linda is an uber-successful trader who was featured in Schwager’s The New Market Wizards. I’m about 2/3rds of the way through the book and really enjoying it so far. It’s filled with tons of humor, great stories about her time spent on the floor, and lots of practical trading advice. Here’s one of her shared lessons learned following a lucky break (random freak weather event) on a soybean trade that resulted in her first big money win. I adopted the philosophy that trading has little to do with brains because overthinking mucks things up. Instead, it was about positioning yourself so that, once in a while, you might get lucky. We’re currently bullish on oil and have been buying some energy names as well as going long the underlying. 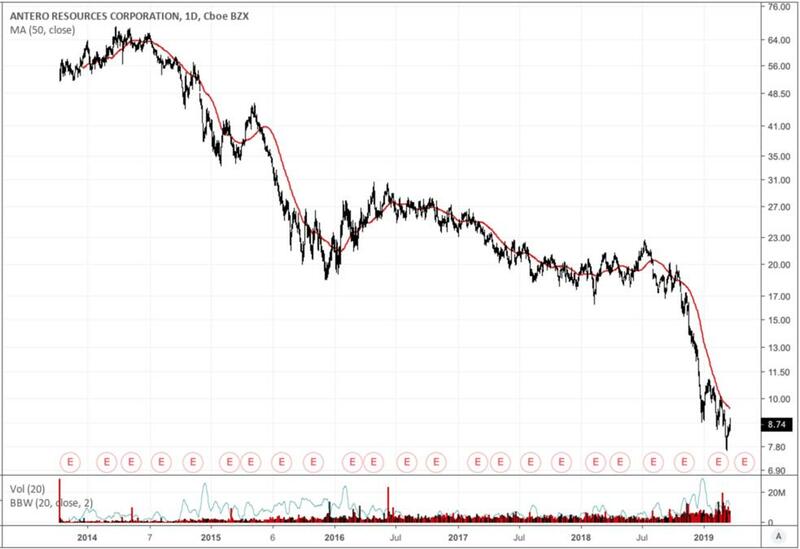 Well, this week, Kuppy, who authors one of my favorite investing blogs Adventures in Capitalism, put out a good write-up on Antero Resources (AR) (one of the companies we’ve been looking at). You can see from the chart that AR has had a tough go as a public company. But, as Kuppy argues quite convincingly, the storm may or not be passing anytime soon but the value to be had is “getting crazy here” to use his own words. Here’s the link and a cut from the piece. At Friday’s closing price of $7.81, the company had a market cap of $2.411 billion. It owned 98.87 million shares of Antero Midstream (AM – USA) with a value of $2.335 billion (at Friday’s closing price of $23.62). You are also promised roughly $300 million in cash from the mid-stream simplification in Q1/2019 and a $125 million payment in early 2020 related to the earn-out on the sale of the water business. Add it all up and the market is valuing AR’s upstream business at a residual equity stub of NEGATIVE $349 million (it’s worth noting that the EV is less extreme as AR does have $3.8 billion in standalone net debt). So what sort of toxic equity stub is the market paying you $349 million to take off its hands? Note: The thesis has changed since the recent kneecapping of AM (down 40% over the last week) so those shares in AM are worth closer to just over a billion dollars. But it’s still interesting nonetheless and there are a number of other energy names trading for very low multiples of current cash flows. 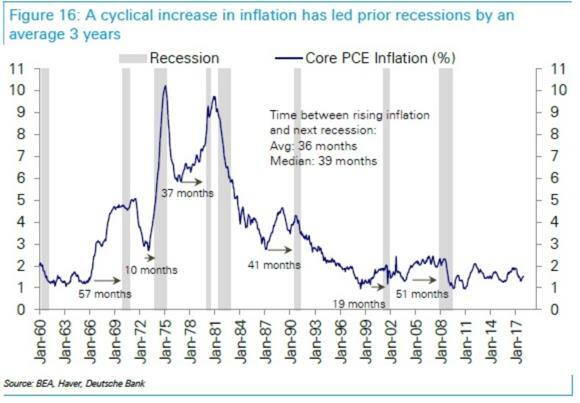 Plus, oil has a tendency to spike in the latter stages of the cycle. That’s it for this week’s macro musings. If you’re not already, be sure to follow me on Twitter: @MacroOps. I post my mindless drivel there daily.